Chicken Pot Pie is the ultimate comfort food! 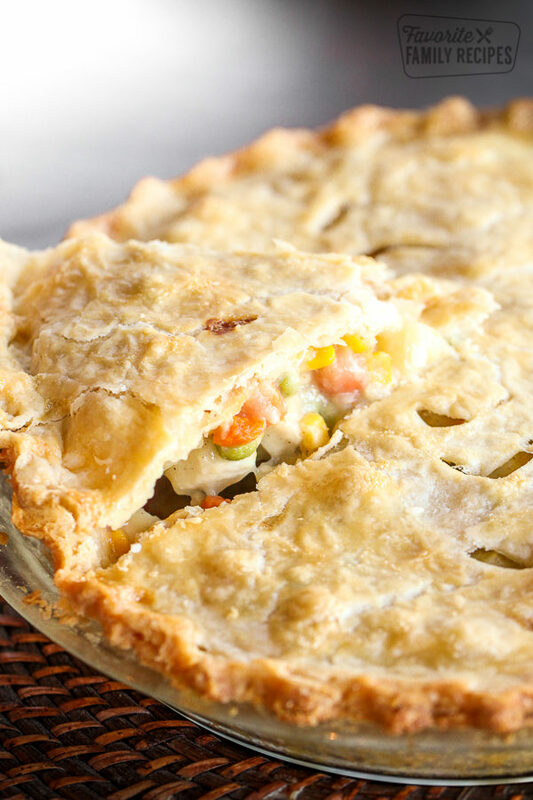 Stuffed with tender chicken and veggies in a creamy sauce topped with homemade flaky crust, this is a favorite dish for a warm, cozy family dinner. Homemade Chicken Pot Pie is one of those dishes I’ve loved since childhood, but was hesitant to learn to make because it seemed to complicated or difficult. But once I tried it, I realized it’s much easier than it looks! It’s just a matter of throwing ingredients into one big pie pan and then slice it up for your family. Easy peasy! 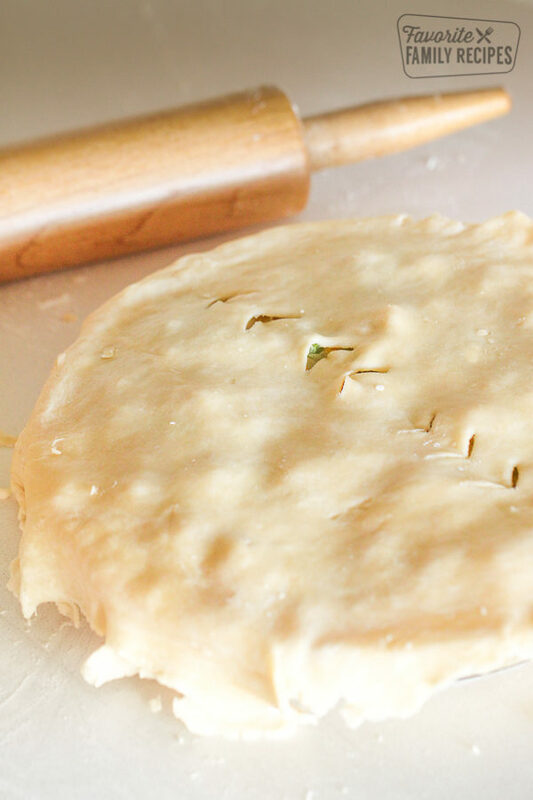 This easy pot pie recipe begins with the most Perfect Pie Crust. Use our recipe and you’ll get flaky, light crust that pairs beautifully with savory ingredients. If you must skip this part, you can use two 9-inch frozen pie crusts. But the homemade crust makes this whole meal so rich and delicious. What Veggies Go In A Chicken Pot Pie? 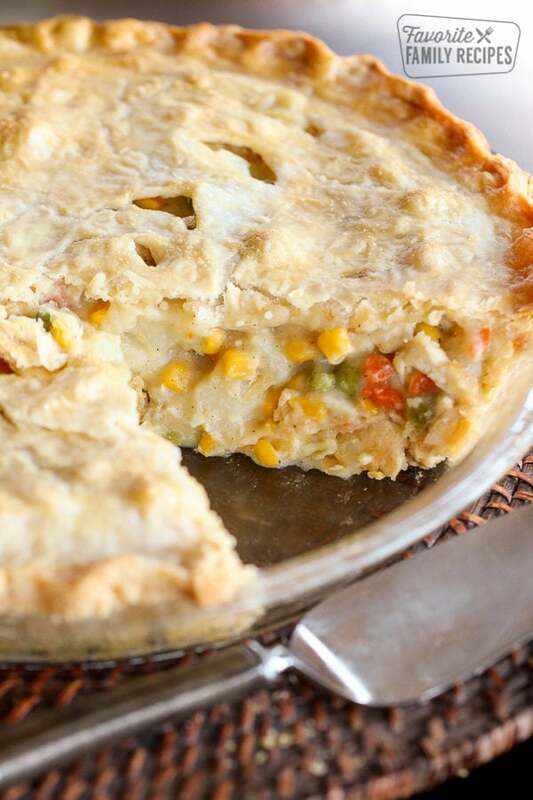 Can Chicken Pot Pie Be Frozen? Yes! Once you assemble the pie, pop it in the freezer until firm, then remove the pie plate and wrap it in freezer safe wrap and it’ll keep for up to three months. When you’re ready to bake your pie, remove it from the freezer and brush the top with a little egg wash. Then bake until brown and bubbly, about 45 minutes. This hearty pie is certainly a dinner all on its own. But it pairs nicely with a green salad or a jello dessert. Who says pie is just for dessert? Try a few of these hearty, savory dishes and serve pie for dinner any time! Add 3 cups water to a saucepan. Add raw chicken breasts and 2 bouillon cubes. Bring to a boil and simmer for 20 minutes or until chicken is no longer pink in the middle. Remove chicken breast from broth and cut into 1/2 inch cubes. Set aside. In the same saucepan, add potatoes, carrots, corn, and peas to broth. Bring to a boil for 10-15 minutes or until potatoes are fork-tender. Remove from heat. Place a colander in a large bowl. Drain vegetables into colander and save the chicken broth in the bowl. In a large pot over medium heat, sauté garlic, onions and celery in butter until soft and translucent. Stir in flour, salt, pepper, and celery seed. Slowly stir in 1 3/4 cups of remaining chicken broth (add water if there isn't quite enough broth for 1 3/4 cups) and milk. Simmer over medium-low heat until thick (if you like a thinner sauce, add more chicken broth and milk a little at a time until you reach desired consistency). Gently stir in the cooked vegetables and cubed chicken to the sauce. Remove from heat and set aside. Place one of the pie crusts in a 9” pie pan. Pour chicken and vegetable filling into the pie crust. Place the top crust over the pie. Trim off any excess of the top crust that comes over the edge of the pie tin with a butter knife. Seal the top crust to the bottom crust by crimping the edge as shown. Slit vents in the top of the crust in a decorative pattern. In a small bowl, whisk egg white until it is foamy. Using a pastry brush, brush the top of the pie with the egg white. Bake for about 35-40 minutes or until the crust is golden brown. *To further prevent pie filling dripping onto the bottom of the oven, place a cookie sheet or a sheet of aluminum foil on the rack below the pie. Did you notice that you have put the celery in in step 1 and 2. Which one is it supposed to be? LOVE this recipe!! maybe a dumb question but is the lb of chicken cooked before putting in oven? Thanks! Yes, it is cooked first! You boiled the chicken raw in the first step, correct? This recipe was so good. Could i make this and fill the pie and freeze unbaked for a later date? Hmmm.. we haven’t tried freezing it before so I don’t know what to suggest! IF you try it, let us know how it turns out! A rotisserie chicken would be delicious! have you ever looked at the sodium content in a rotisserie chicken? This was delicious! I had a very good chicken pot pie recipe, but it called for heavy cream and I didn’t have any. I’m glad I came across yours, using milk for the gravy. it came out perfect. My husband was thrilled because I made it with the double crust, something i usually don’t do. I followed the recipe exactly, only using my own stock and adding the bouillon as described in the comments. I wouldn’t change a thing and will be making this again. Thanks for sharing your recipe. Thank you for your comment! We love to hear success stories! Made this tonight for dinner and the entire thing was devoured!!! So thankful to have came across your post! That’s the best compliment to a cook! So glad you enjoyed the recipe! So glad you like it! Glad it is keeping you and your family warm way over there in New England… brrrrr! You guys have had a rough one this year! My boyfriend has been asking me to make chicken pot pie for a while and i came across this recipe. Easy, delicious and my guy loved it! Thank you for sharing your success! I’m so glad you like the recipe. This is the best recipe! I made it a few months ago and my husband has been talking about it ever since! Going to make it again tonight!! Thank you – this is definitely a favorite at our house too. So glad you liked it! Hi Cindy– I would do a little extra crust to cover it (maybe 1 1/2 times) but we have never done it in a 9×13 before so I can’t tell you for sure. Let us know if you try it and how it turns out! My wife loves homemade pot pie, but I was hesitant to make it–because who can really live up to Grandmother pot pie types of expectations? But this was AWESOME. She loved it and it did a husband proud to see his lady happy. Awesome recipe; thanks for sharing! That’s awesome, so glad you liked it! Made it for the first time a few weeks ago. My boyfriend and I loved it. So glad I came across this recipe for an easy dinner that tastes fantastic! We have one in the oven right now. I am making it right now, too (with leftover turkey)! I made this for dinner tonight and we loved it. I would highly recommend this recipe. I made this for the first time and it was fantastic! I didn’t have celery so I substituted that with celery salt perfect taste. I made two pies and froze one for later. So glad you liked it! Great idea to make one for later! Any suggestions of a good side to go with this? I am delivering to a new mom and figured something else should go with it. That is so nice of you! I like to serve this pot pie with a green salad or a fruit salad. I think either would be perfect! Have you tried freezing it? Have a ton of left over turkey from Christmas dinner and want to make one for now and one for later!! Looks delish!! Have you tried to freeze this?? Have lots of leftover turkey from xmas dinner and was hoping to make a double batch, one for now and one for later!!! Looks delightful! Thanks!! I haven’t tried freezing it myself, but I don’t see any reason why it wouldn’t freeze. I see frozen pot pies in the freezer section of the grocery store all the time. I know the crust will freeze just fine, and there aren’t any ingredients in the pie that won’t freeze. Great idea to use leftover turkey! Just made this tonight. It’s awesome!! If I use rotisserie chicken do I skip step 1 obviously..? But how would I get the chicken broth flavor? You can just use canned/boxed chicken broth or you can add chicken bouillon to season. Hope this helps!